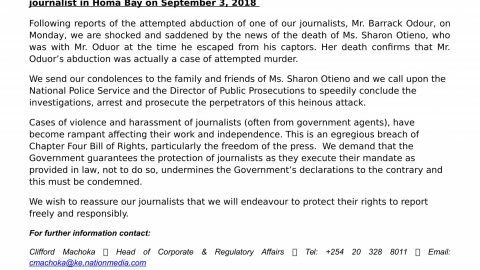 The Nation Media Group condemns the attack on journalists by the police at the Jomo Kenyatta International Airport on night of Monday March 26, 2018 during the coverage of the return deported lawyer and opposition activist Miguna Miguna. Nation Media Group notes with regret the position taken by columnists who have been writing for NMG platforms and have decided to stop writing for our publications. We respect their right to take a collective decision, although each of them had an individual contract that we have diligently honoured over the years we have worked with them. We wish to reiterate that overall we have honoured our obligation to respect their views and did not tamper with their positions except to correct basic errors.